The Children’s Theater series is geared toward children of all ages. Each show will be performed at multiple locations around the city included Downtown Pittsburgh’s Cultural District, Mt. Lebanon High School, Penn Hills High School and Marshall Middle School. Click here to see a full list of performance locations across the city. Children under 2 are free, but do require a lap pass. Season tickets are just $40 for 5 shows. That breaks down to less than $10 per show per person. Click here to get your season passes. You can also enter the giveaway below. If you want to take your chances at winning tickets to see one show during the Citizen’s Bank Children’s Theater Series, enter the giveaway below. You could win 4 tickets to one performance during the theater series. May the odds be in your favor. 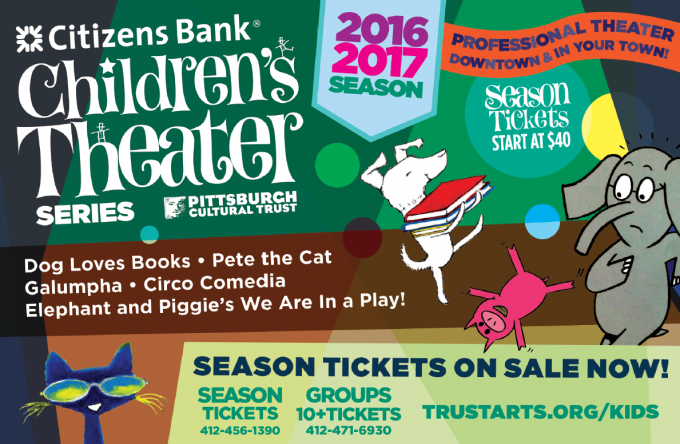 Follow the Pittsburgh Cultural Trust for more kid-friendly theater in Pittsburgh.